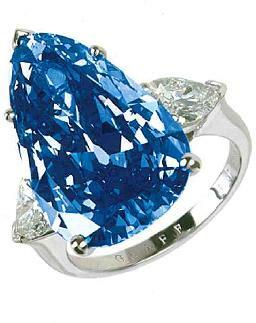 Not to be confused with the Graff Imperial Blue, a stone which I am still looking for a photo of. I was not able to find many details about this stone, other than its weight, which is apparently 6.19 carats. If the Graff site ever goes into more detail about their unusual stones, I'll post more about this one. This photo is from the auction catalogue for Christie's May 1st, 2000 auction in Hong Kong. 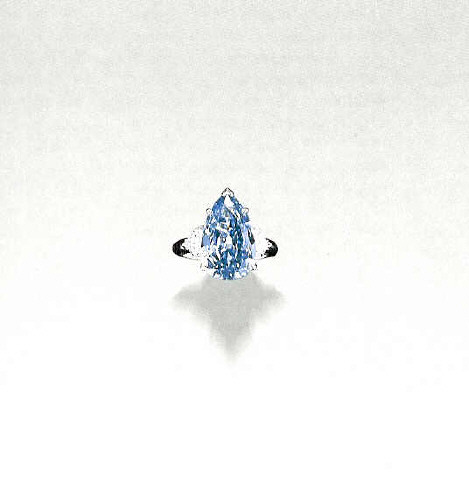 Natural blue diamonds command some of the highest prices in the world of gemstones. The more intense the blue color, the higher the price. Natural blue diamonds like the Wittelsbach,the Transvaal Blue, the Sultan of Morocco and of course the Hope are extremely rare gems.